Nordlandshest / Lyngshest horses, also known as the Northlands horse or Northlands pony, originated in Norway. 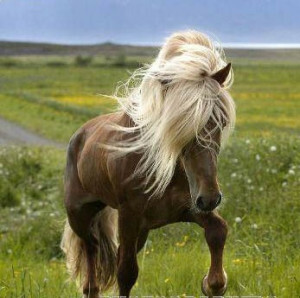 They are the smallest of the three Norwegian national horse breeds. They originated in Lyngen, but were given the name Nordlandshest in 1968 by breeders in that area. The name change was hotly disputed by breeders in Lyngen and surrounding areas, but a compromise was later reached, and today their official name is both Nordlandshest and Lyngshest. The first documentation of Nordlandshest / Lyngshest horses date back to 1898, in Lyngseidet, Troms. Organised breeding began in the 1930s, when most of the breed population lived in the northern counties of Norway. Many of them died and few were bred during World War II, and they remained endangered into the 1960s. There were only about 15-20 left, mostly older mares, and only one stallion; Rimfakse, from whom all Nordlandshest / Lyngshest today descend. The breed was saved due to the efforts of people like Christian Klefstad who laboured intensely to bring the breed back, traveling all over northern Norway to gather fertile horses for breeding. By 2005, approximately 3000 horses were in the national registry, and about 200 foals are born every year. In 2013, approximately 2500 individuals were reported to be registered, with annual births of approximately 200. Nordlandshest / Lyngshest horses are a small and sturdy horse with drive and eagerness to work. They are surefooted and very strong considering their size. They typically have a little feather on their legs and they grow a heavy winter coat. Their height at their withers varies between 12.1 and 14.1 hands (49 and 57 inches, 124 and 145 cm), with most horses falling between 12.3 to 13.3 hands (51 to 55 inches, 130 to 140 cm). Their gait is smooth, correct, and agile with good overreach. Emphasis is placed on good hock action in all gaits. Their trot is energetic and ground-covering with good suspension. Their gallop is light with good rhythm. They are found in chestnut, bay, black, palomino, buckskin, silver dappled bay, silver dappled black, silver dappled buckskin, and gray. BEC/Blue-eyed cream individuals may not be accepted in the studbook. Star and blaze are common markings, but blazes extending to the eye area, bald faces, and stockings reaching or exceeding 1/3 of the cannon on hind legs are discouraged. Blue eyes, white markings on the body, and "white reaching the skin of the forelegs" are disqualifying faults.